1. Down near the bottom of this page, there is a spot where podcasts from Tor Books (the great sf publisher) show up. 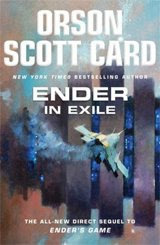 Available now is one consisting of Orson Scott Card talking about his new book Ender in Exile. His comments on this book and the others are interesting as are his remarks on how the smartest kids are usually treated in society and handled by the educational system. I know that a few posts ago I acted like I didn't really care anymore about the Ender series save for my deep affection for Ender's Game itself and the parallel Bean-focused book Ender's Shadow (and I may have also carped a bit about Card's politics)...but listening to Card today might re-interest me in it because the timeframe of the new book apparently overlaps and closely follows those other two books, happening more or less between the last couple of chapters of Game and concurrently with the Shadow series. 2. The other day I posted a note about my worries concerning the print version of the M-Brane SF zine. If anyone else is worried about it, see the comments with that post from 12/5 and feel free to add...a writer that I plan to publish in the first issue made some good points about the desirability of the print version. I am presently investigating a POD (print-on-demand) option that I think may solve some problems for me as far as upfront cost on a print edition of an as yet unsold zine and also liberate me of some of the printing/mailing hassles. It'll come together: it's just a matter of putting the people with the content (me and the writers) with the people who print and ship stuff, and I think I am close to a good solution. I also think that once the mag actually launches, then some of these worries that I have about formats will dissipate. I will update as things develop.